In Forza Horizon 4, there are 12 different houses that players can find on the map. Some houses can be purchased, while others are unlockable. As for why a player would want to collect these houses in Forza Horizon 4, it’s because they offer garage space where players can store vehicles. Additionally, a few of these houses offer player perks such as Skill Song, Drone Mode, and Fast Travel Anywhere. If you’ve been having trouble finding one or more of these houses in Forza Horizon 4, we’ve got you covered. Below, we’ve put together a quick guide on where you can find all 12 houses in Forza Horizon 4! The first house you can find in Forza Horizon 4 is known as The Gables. House #1, The Gables: The first house in Forza Horizon 4 is known as The Gables and can be found west of Ashbrooke and south of Uffington White Horse. This is one of the first houses players can unlock, and offers a perk called Drone Mode. House #2, Fairlawn Manor: The second house in Forza Horizon 4 is known as Fairlawn Manor and can be found northeast of Great Ridge and north of Moorhead Wind Farm This house can be purchased and offers a perk called Fast Travel Anywhere, which grants players the ability to instantly travel to any road on the map in Forza Horizon 4. House #3, Bamburgh Castle: The third house in Forza Horizon 4 is known as Bamburgh Castle and can be found south of the lighthouse right near the beach. 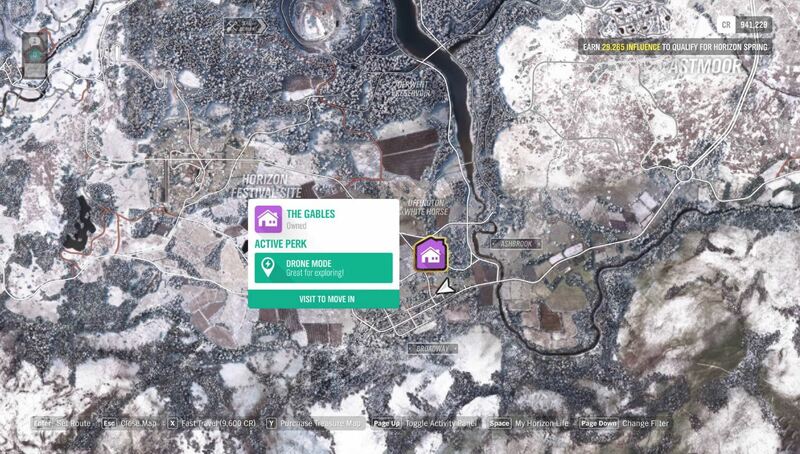 This house can be purchased, and while it doesn’t offer a perk, it does unlock one of the barns on the Forza Horizon 4 map. House #4, Thatch Corner: The fourth house in Forza Horizon 4 is known as Thatch Corner and can be found on the edge of the beach east of Astmoor. House #5, Kingfisher Cottage: The fifth house in Forza Horizon 4 is known as Kingfisher Cottage and can be found on the lower right side of the slate quarry, northwest of Derwent Reservoir. House #6, Sunflower Meadows: The sixth house in Forza Horizon 4 is known as Sunflower Meadows and can be found below the Ambleside marker on the western edge of the map. House #7, Derwent Mansion: The seventh house in Forza Horizon 4 is known as Derwent Mansion and can be found towards the lower west end of the Derwent Water lake. House #8, Lake Lodge: The eighth house in Forza Horizon 4 is known as Lake Lodge and can be found north of Mortimer Gardens directly above Derwent Water lake. This house is free for VIP Forza players and offers the perk #ForzathonBoost which gives players double #Forzathon points. House #9, The Huntsman’s Lodge: The ninth house in Forza Horizon 4 is known as The Huntsman’s Lodge and can be found in Lakehurst Forest. This house can be purchased and offers a perk called Skill Song which lets radio hosts play skill songs in Forza Horizon 4. House #10, Croftdale Farm: The tenth house in Forza Horizon 4 is known as Croftdale Farm and can be found north of Gen Rannoch. House #11, Edinburgh Castle: The eleventh house in Forza Horizon 4 is known as Edinburgh Castle and can be found in the heart of the city north of Queensforth Golf Course. This house can be purchased for 15 million Credits. House #12, Castleview Road: The twelfth house in Forza Horizon 4 is known as Castleview Road and can be found outside the main city north of Greendale Airstrip. While you don’t necessarily need to own all 12 of these houses in Forza Horizon 4, they’re definitely worth collecting for the perks they offer, and the garage space. Additionally, finding them all is a fun process that lets you drive around and explore the gorgeous map of Forza Horizon 4. Which of the 12 houses in Forza Horizon 4 is your favorite? Let us know down in the comments below! By reading through this guide, you should now know where to find all 12 houses in Forza Horizon 4.